that the Biblical New Year is reckoned by the New Moon closest to the vernal equinox. (1) What does the Bible say or indicate about the New Year? 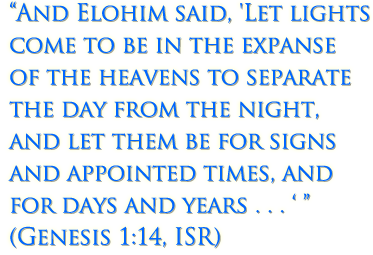 Genesis 1:14 states in plain language that the heavenly bodies are to be for "signs and appointed times, and for days and years." There is no mention of vegetation in this passage. Nowhere in Scripture is it stated that the beginning of the year is to be determined by examining barley. To suggest that the New Year hinges on the ripeness of the barley, when Scripture incontrovertibly declares that the heavenly bodies are to determine years, is to add to Yahuwah's Word. Now that we have established with certainty that the heavenly bodies are to determine years, the question is "What is it that takes place in the heavens to let us know that Winter is over and a New Year can begin?" A very important clue can be found in Exodus 34. While it is not immediately apparent from the KJV, the word translated here as "end" [Strong's H8622] is referring to the fall equinox (also called the Autumnal equinox) in the middle of the year. This is confirmed by the fact that the Feast of Ingathering, also referred to as the "Feast of Tabernacles" and the "Feast of Booths," takes place in fall, in the Seventh Month (Leviticus 23:34) - in the middle of the year, not at the end of the year. The translations below offer a more accurate rendering of Exodus 34:22. The Feast of Ingathering is associated with the fall equinox in the middle of the year. It is only logical to conclude based on the above that the beginning of the year then is connected to the spring equinox, which takes place about six months before and after the fall equinox. If the fall feasts are connected to the fall equinox in the middle of the year, then the spring feasts must be connected to the spring equinox at the beginning of the year. It is very important to note here that the Feast of Ingathering is directly associated with the fall equinox; therefore, in order to fulfill the Biblical mandate, the Feast of Ingathering must be held on or very near the fall equinox. (1a) Is this in agreement with reckoning the New Year by the first New Moon after the vernal equinox? (1b) Is this in agreement with reckoning the New Year by the New Moon closest to the vernal equinox? (2) What do 1st century historians tell us about the New Year? Philo, a Hellenistic Jewish Philosopher who lived before, during, and after our Saviour's earthly ministry, recorded many of the details relating to Biblical calendation in the 1st century. In the below quotations, Philo confirms that the Feast of Unleavened Bread is tied to the vernal equinox and that the Feast of Ingathering is tied to the fall equinox. Flavius Josephus, a 1st century Romano-Jewish scholar, sheds even more light on the issue by confirming our understanding from another angle. Josephus comments on the position of the sun in relation to the stars at the time of the Passover. Before commenting on this intriguing quote by Josephus, it is imperative that we understand the following: The celestial equator in relation to the stars is not the same as what it was in the days of Josephus. In the 1st century, the vernal equinox would have taken place just as the sun was entering the sign of Aries (the Ram). Today, however, the equinox occurs in the sign of Pisces. Above: Equinox, 31 AD - Note that Aries is in the immediate path of the sun following the equinox. 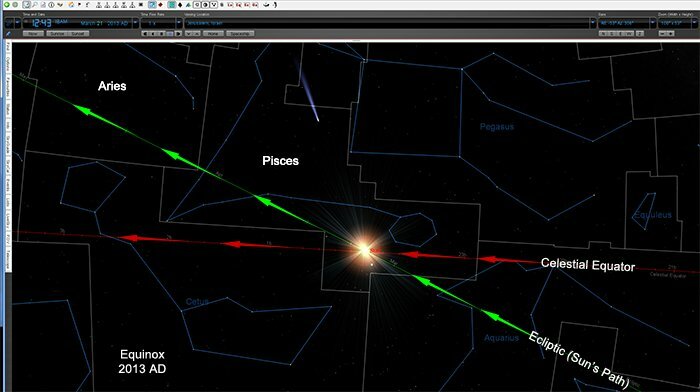 Above: Equinox, 2013 AD - Note that Aries, today, is no longer in the sun's immediate path following the equinox. Although we cannot use the same constellation today that they did in the 1st century to determine the beginning of the year, we can determine with a fair degree of certainty how the New Year was reckoned in relation to the equinox. Here, Josephus plainly states that Passover was observed when the sun was in the sign of Aries. (2a) Is Josephus' testimony consistent with always reckoning the first New Moon after the vernal equinox as the beginning of the year? No. 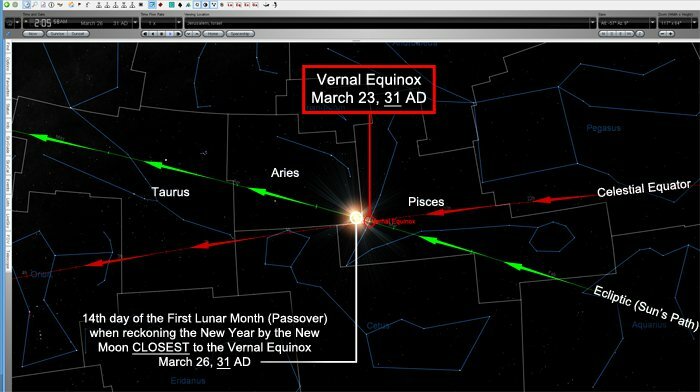 If, in the 1st century, they had demanded that the first New Moon after the vernal equinox was always the beginning of the year, Passover would sometime be observed when the sun was in the sign of Taurus (well past the sign of Aries). Sometimes, this method would place Passover in Aries; sometimes it would not. (2b) Is Josephus' testimony consistent with reckoning the New Moon nearest the vernal equinox as the beginning of the year? Yes. 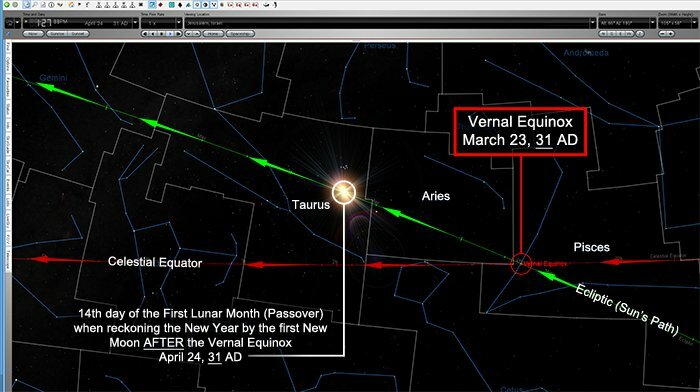 If, in the 1st century, the New Moon nearest the vernal equinox was reckoned as the beginning of the year, Passover would have consistently fallen in close proximity to Aries. Using this method would be much more consistent with the testimony of Josephus. Above: 31 AD - Reckoning the New Moon nearest the vernal equinox as the beginning of the year would have placed Passover (the 14th day of the lunar month) in the sign of Aries, in agreement with Josephus' testimony. Now let us examine a remarkable passage from Eusebius' Ecclesiastical History. Eusebius was a Roman historian who lived from about 260 AD to 340 AD. In the following passage, he is quoting from the Canons of Anatolius on the Paschal (Passover) Festival. ". . . all alike should sacrifice the passover offerings after the vernal equinox, in the middle of the first month." "Aristobulus adds that it is necessary for the feast of the passover, that not only the sun should pass through the equinoctial segment, but the moon also. For as there are two equinoctial segments, the vernal and the autumnal, directly opposite each other, and as the day of the passover was appointed on the fourteenth of the month, beginning with the evening, the moon will hold a position diametrically opposite the sun, as may be seen in full moons; and the sun will be in the segment of the vernal equinox, and of necessity the moon in that of the autumnal [equinox]." Above: This is an illustration of what happens at the first full moon after the equinox. 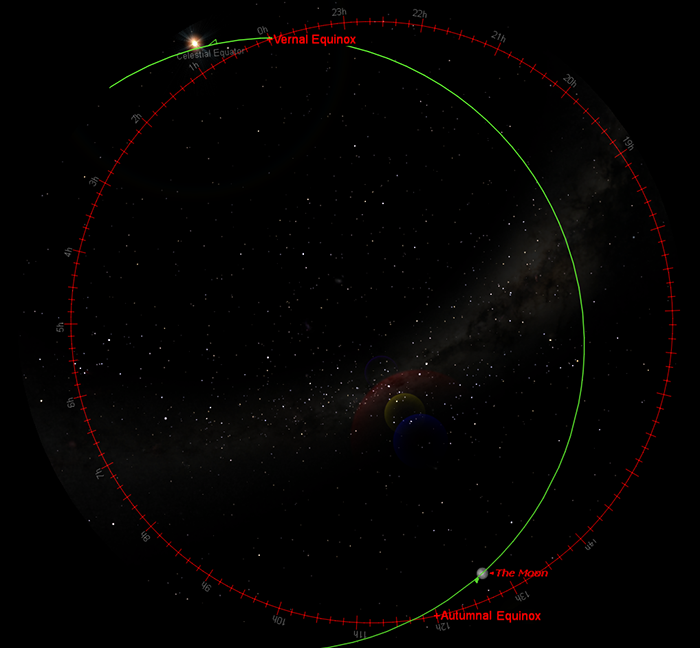 The green circle represents the counter-clockwise path of the sun and moon. Note that both the sun and the moon have crossed the celestial equator (represented by the red line) and are positioned diametrically opposite one another at the "equinoctial points," the sun at the vernal equinox, and the moon at the autumnal equinox, exactly as described Aristobulus, according to Eusebius. Note: In addition to being consistent with Eusebius' commentary on Biblical calendation principles, ensuring that Passover always falls after the vernal equinox is also very logical, in that it will guarantee that only one Passover is observed within each solar year (vernal equinox to vernal equinox). (2c) Is the historical record in agreement with reckoning the New Year by the first New Moon after the vernal equinox? ...will sometimes place the Feast of Ingathering well past the fall equinox, which is not in harmony with Philo's testimony (or Scripture). ...will sometimes allow the fall equinox to occur in the sixth month, which is not in harmony with Philo's testimony (or Scripture). ...would sometimes have placed the sun in the sign of Taurus (well past the sign of Aries) at the time of the Passover in the first century, which is not in harmony with Josephus' testimony. (2d) Is the historical record in agreement with reckoning the New Year by the New Moon closest to the vernal equinox? Yes. Reckoning the New Year by the New Moon closest to the vernal equinox (which rightly interpreted will always place the full moon and the Passover after the equinox) is consistent with the testimony of Philo, Josephus, and Eusebius. The testimony of early historians indicates that it was the New Moon closest to the vernal equinox that began the year (which rightly interpreted will always place the full moon and the Passover after the equinox). One cannot maintain harmony with the testimonies of Philo and Josephus, while adhering to the first New Moon after the equinox methodology of reckoning the New Year. (3a) When reckoning the New Year by the first New Moon after the vernal equinox, are all three taken into account (sun, moon, & stars)? No. Josephus' testimony of how the stars (i.e. the sign of Aries) coincided with Passover in the first century must be disregarded in order to cling to this method of reckoning. (3b) When reckoning the New Year by the New Moon closest to the vernal equinox, are all three taken into account (sun, moon, & stars)? Yes. This method is in harmony with Josephus' testimony of how the stars (i.e. the sign of Aries) coincided with Passover in the first century. 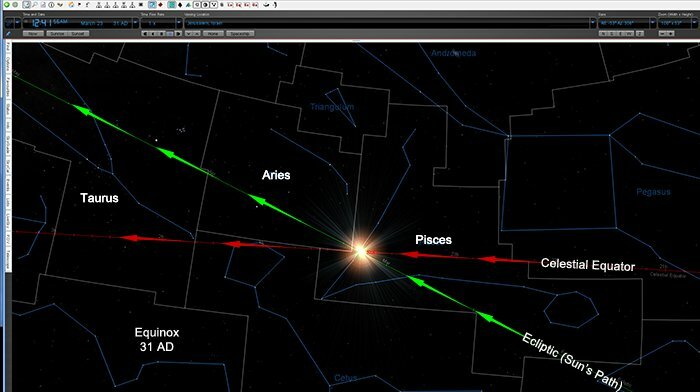 Note: Although the progression of the sun across the celestial equator has changed in relation to the stars since the days of Josephus, we can still use the stars in a sense to confirm the beginning of the year. While it might on a rare occasion be possible for the sun to reach the sign of Aries by Passover, the sun will most often be in the sign of Pisces on Passover. Today, the sun will always be in Pisces when the vernal equinox takes place, and in Virgo when the fall equinox takes place. Reckoning the New Year by the New Moon closest to the vernal equinox is consistent with Scripture, in that it takes into account, and is in harmony with the historical testimony of how the stars (i.e. the constellation of Aries) coincided with Passover in the first century. (4a) Is the Metonic Cycle manifested when reckoning the New Year by the New Moon closest to the vernal equinox? (5) There will be two total lunar eclipses (often called "blood moons") in 2014 and two total lunar eclipses in 2015 (4 in all; a "tetrad"). Could this very rare occurrence be a sign pointing Yahuwah's faithful to the correct method of determining the New Year? Given the tremendous importance that Scripture places on the heavenly bodies, it is not unreasonable to conclude that these eclipses are, in fact, a divine marker, and that there coinciding with the annual Feasts is not arbitrary. (5a) Will these eclipses coincide with the first day of Unleavened Bread and the first day of Tabernacles both years when reckoning the New Year by the first New Moon after the vernal equinox? No. They will coincide only with the Feasts in 2014. The Feasts in 2015 will fall one month later than the eclipses. (5b) Will these eclipses coincide with the first day of Unleavened Bread and the first day of Tabernacles both years when reckoning the New Year by the New Moon closest to the vernal equinox? Yes. They will coincide with the Feasts in both years (2014 & 2015). It would be irresponsible for Yahuwahs' faithful to disregard the signs taking place in the heavens in these last days. It is Yahuwah's hand that upholds and orchestrates everything in Creation. In these closing moments, Yahuwah's faithful should be especially mindful and observant of all that takes place in the heavens. Note: This is not necessarily intended to be evidence in favor of using the nearest New Moon to the vernal equinox method of reckoning, for there have been tetrads of lunar eclipses in the recent past (e.g. 1967-1968) that would not have lined up with the feasts using this reckoning. It is, however, very interesting to note this phenomenon. WLC believes, based on the Exodus 34:22 mandate, that the Biblical New Year is reckoned by the New Moon closest to the vernal equinox. The historical commentary on the matter only buttresses what was deduced from Scripture alone. (1) Question/Objection: If the New Moon nearest the vernal equinox is the true beacon of the New Year, how can we know in advance which New Moon will be the closest? How could ancient Israel have possibly known this? ANSWER: These are very good questions. There is no doubt that the faithful Israelites had to have known well in advance when the Passover would be observed. In years when the Passover fell very close to the vernal equinox (e.g. the day after), the Israelites living outside of Jerusalem would have had to begin their journey even before the equinox had taken place. It is not clear at this time just how the Israelites were able to anticipate when the vernal equinox would occur in relation to the New Moons - so that they could declare with certainty the beginning of the year. One thing is certain, though: the ancient Israelites had an incredible understanding of the heavens. We, today, with all of the available technology are likely only approaching what would have been common knowledge to the average Israelite. Our ignorance, today, is proof of nothing except the loss of knowledge that comes through rebellion and disobedience. Our inability to understand the machinations of the heavens as the ancients did in no way negates the overwhelming evidence that it is the New Moon nearest the vernal equinox that begins the Biblical year. 180 days - 15 days (the approximate number of days remaining in the 7th month) = 165 days remaining until the vernal equinox, on New Moon Day of the 8th month. 165 days - 29.5 (approximate number of days in a lunar month) = 135.5 days remaining until the vernal equinox, on New Moon Day of the 9th month. 135.5 days - 29.5 (approximate number of days in a lunar month) = 106 days remaining until the vernal equinox, on New Moon Day of the 10th month. 106 days - 29.5 (approximate number of days in a lunar month) = 76.5 days remaining until the vernal equinox, on New Moon Day of the 11th month. 76.5 days - 29.5 (approximate number of days in a lunar month) = 47 days remaining until the vernal equinox, on New Moon Day of the 12th month. 47 days - 29.5 (approximate number of days in a lunar month) = 17.5 days remaining until the vernal equinox, on New Moon Day of the following month. Since 17.5 days is significantly more than 14.77, which is approximately half the number of days in a lunar month, this will likely be a 13th month, and the next New Moon Day (which will fall about 12 days after the vernal equinox) will begin the year. Note: Once the current position in the 19-year pattern (Metonic Cycle) has been established with certainty, the number of months in future years (and consequently the first month of each year) can be known well in advance. Doing the math in this fashion certainly cannot account for their ability to accurately anticipate the beginning of the year when the vernal equinox fell very close the full moon in the middle of the lunar month, but, again, their knowledge of the heavens was irrefutably superior to ours. It bears repeating that our inability to understand the machinations of the heavens as the ancients did in no way negates the overwhelming evidence that it is the New Moon nearest the vernal equinox that begins the Biblical year. (2) Question/Objection: Philo states that the "beginning" of the vernal equinox is the first month of the year. Does this not indicate that it is the New Moon after the vernal equinox that begins the year? ANSWER: This is an excellent question. (WLC originally misinterpreted this commentary in the same way.) At first glance, it appears that Philo is saying that the first lunar month of the year begins with the vernal equinox. Philo, here, cannot be referring to lunar months, though; the lunar cycle pays no attention to when the equinox occurs, and consequently, the New Moon does not consistently line up with the vernal equinox. Philo, here, is apparently referring to solar months, not lunar months. A solar month is determined by the sun's location in the zodiac; the first solar month begins with the vernal equinox. In Philo's day, the first solar month was Aries (as noted by Josephus), followed by Taurus, Gemini, etc. The first solar month of each solar year begins with the vernal equinox. Later in this passage, Philo goes on to say "in this month, about the fourteenth day of the month, . . . [the] feast of the passover is celebrated." Here Philo is clearly referring to the first lunar month. When viewed together, we see that Philo is restating what we learned earlier from Josephus: The Passover (the 14th day of the first lunar month) was observed in the first solar month (when the sun was in Aries). This statement says nothing about reckoning the New Year by the first New Moon after the vernal equinox. (3) Question/Objection: Philo states that months are reckoned "from the vernal equinox." Does this not indicate that it is the New Moon after the vernal equinox that begins the year? ANSWER: Here, again, Philo is not referring to the cycle of lunar months, but rather to the cycle of solar months, which as we discussed in the previous "question/objection," commences at the vernal equinox. Further proof of this is found later in this passage, when Philo makes reference to Aries, "the Ram the head of the zodiac," which in the first century, was the first month of the solar year. Again, this statement says nothing about reckoning the New Year by the first New Moon after the vernal equinox. (4) Question/Objection: Reckoning the New Year by the New Moon closest to the vernal equinox would not allow enough time for the barley to become ripe ("Abib") before the day of First Fruits. ANSWER: Much could be said on this point, but we need not spend an exuberant amount of time addressing this in order to expose the fallacy. We need only look at what Scripture actually says about "Abib" and the First Fruits offering. Abib does not mean "ripe," nor does it mean 16 days3 from being ripe. It simply means young or green. This, really, is the crux of the matter. When Moses recorded the Abib state of the barley (Exodus 9:31), he was simply stating that the barley had sprung up; it was green and growing. That is why it was destroyed, while the wheat and the rie (which had not yet sprung up) were not (Exodus 9:32). When Scripture refers to the "month of Abib," it is simply referring to the month in which the crops mature, or begin to mature. The second very important point we need to address is Yahuwah's instructions regarding the First Fruits offering. Simply put, there is no mention here of "mature" barley. The command is simply to bring a sheaf of first fruits to the priest to wave on the appointed day, and not to eat of the fields until this had been done. As responsible Bible students and seekers of truth, we cannot ignore the weight of evidence identifying the New Moon closest to the vernal equinox as the beginning of the year in favor of the Karaite Jewish tradition, and a presumed understanding of the ripening crops in ancient Palestine. (5) Question/Objection: I was always taught that the New Year could not be declared until the Palestinian barely was ripe. Why do you not take the ripeness of the barley into consideration? Nowhere in Scripture is there any mention of a "barley harvest law." Genesis 1:14 declares that the heavenly bodies are "for seasons, and for days, and years." While we can logically conclude that the barley would need to be ripe for the day of firstfruits, and we can contextually verify that the barley was nearing maturity when the hail plagued Egypt (Ex.9:22-31), nowhere in Scripture does it say that vegetation (i.e. barley) is to be for "for seasons, and for days, and years." The concept of "years" is introduced pre-sin, pre-flood, and pre-curse (Genesis 1:14), at least 1,500 years before the flood (2,500 years before the Exodus). It does not seem reasonable to presume that the antediluvian world was dependent upon barley for determining the New Year. It does make sense, however, to conclude that they were dependent upon the heavenly bodies, Yahuwah's ordained calendar, for determining "seasons, . . . days, and years." Noah was able to accurately keep track of time during the flood (without planting barley). The children of Israel were able to keep track of time during their wilderness experience (without planting barley). Numbers 9:1-14 explains how the children of Israel kept the Passover in the wilderness. To suggest that the ripeness of Palestinian barley is the only way to determine the beginning of the year is to suggest one of two things: (1) Those living outside of the geographic region of Palestine are entirely dependent upon internet technology (for receiving witness to the state of Palestinian Barley, which is itself incredibly trivial, given the nature of today's agricultural practices); (2) Yahuwah's faithful must rely on tradition and man's version of history which declares the acceptable parallel of Gregorian dates in which the "latter rains" would have fallen two thousand plus years ago. In a sense, this implies that we need the Gregorian calendar to determine the beginning of the New Year, for without it, we could not know the satisfactory dates for beginning the New Year. It is not acceptable to suggest that Yahuwah's faithful must rely on man's guesswork or the papal Gregorian calendar for reckoning the Biblical New Year. Nor is it acceptable to suggest that the faithful must rely on internet technology and modern agricultural practices in the middle east. Note: WLC believes that Jerusalem time should be used to determine the beginning of the year, not because WLC reckons earthly Jerusalem as today holding an exalted position, but because the feast days are anniversaries of real events. Passover, for example, was the day of our lord's crucifixion in Jerusalem. Using Jerusalem time (in relation to the vernal equinox) to begin the year ensures that we are observing the feast days on the same days as Christ and his apostles 2,000 years ago. 1 Exodus 9:31 records that the barley and the flax were nearing maturity when they were destroyed by the plague of hail. By this, we know that it was springtime, or nearing springtime. 2 There are approximately 180 days between the autumnal equinox and the vernal equinox.